I’m feeling very relaxed and happy with life this morning, mostly because I’ve just returned from spending the weekend in the most amazing Bed and Breakfast I may ever have had the good fortune to visit. Bensons Townhouse is an imposing Grade II listed Georgian property with a fascinating history that has been wonderfully renovated by the current owners, Jonathan and Sarah Barnes. 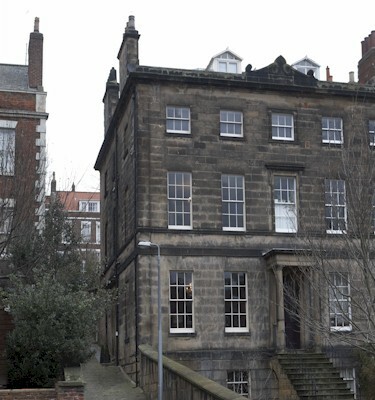 It is rated as five star accommodation by Visit England, the only B&B with this rating in Whitby. On our arrival, Jonathan came out to meet me and my husband at the car-park and showed us to our room and then Sarah produced the perfect cup of tea and cakes for us to enjoy in a comfortable pair of leather sofas; the ideal way to start relaxing. The house is impeccable; elegant, grown-up and tastefully finished. 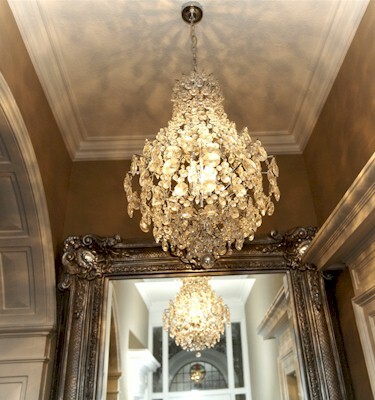 Glittering chandeliers and ornate mirrors provide a beautiful contrast to the muted walls (think Farrow and Ball colour palette) timeless, classic furniture and period features. We stayed in Room 2, the smaller of the two rooms, which was perfectly appointed and with a king sized bed so comfortable, I’d still be there now, given the choice… When I think about the sanctuary I’d like my bedroom at home to be, I now have a frame of reference. Basically, I want to transport the bedroom from Bensons Townhouse, lock, stock and barrel back to Leeds. With its high ceiling, period shutters and air of tranquility, it was perfect. Every little luxurious detail was carefully thought out, from the Yorkshire tea and flask of fresh milk on the hospitality tray, to the wine and chocolates waiting for your arrival. The bathroom was immaculate, with the whitest, fluffiest towels, two sinks and lots of lovely toiletries. We had a flat-screen TV (which sadly got used to watch Match of the Day – some things never change…) and an Ipod docking station next to the giant, goose-down-duvet-covered and incredibly comfortable bed. I’m really in love with that bed, can you tell? Despite the perfect and very stylish feel to the whole place, that does not mean it is intimidating. Far from it. The welcome we received was really warm, and we felt comfortable and relaxed straight away, which is so important to us when we only have a short time to enjoy the peace and luxury of time away from our usual responsibilities. Of course, one of the most important parts of staying in a Bed and Breakfast has to be the breakfast itself and here, Bensons Townhouse also excels. Served in an elegant dining room, a range of cooked options, together with an extensive variety of cereals, fruits, juice, toast and croissants were available, and everything we had was excellent. My husband said that his full English breakfast, using locally sourced ingredients, was one of the best he’d ever had. I had scrambled eggs with bacon and an English muffin, which was perfectly cooked and beautifully presented with chives and roasted cherry tomatoes. It’s easy to see why they’re already in possession of a Breakfast Award from Visit England. Thankfully, on Sunday we were blessed with a sunny clear blue sky and so were able to walk off some of the calories on a coastal stretch of the Cleveland Way National Trail afterwards! In the past, I’ve avoided staying in Bed and Breakfast accommodation, preferring the relative anonymity of a hotel over feeling like I might be imposing on someone’s private home. However, this stay has made me re-think this completely. It was a little like staying in the tiniest boutique hotel, with the warmest, kindest hosts imaginable – even my husband’s charity Movember moustache didn’t phase them! It feels really clear to see through the work Jonathan and Sarah have put into the property, the attention to detail and the attentive customer service that this is a labour of love for them and as a guest, that makes for a superb experience. After what amounted to a perfect weekend, I was terribly sad to leave, and am already trying to work out when I can make a return visit. 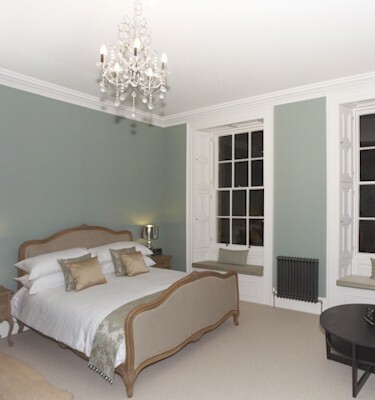 If you’re planning a stay in Whitby, look no further than Bensons Townhouse. I honestly believe it to be flawless. NB: I know this reads like a sponsored post, but it’s not. I was a regular paying guest and just asked afterwards to borrow a few photographs as my own didn’t do the place justice. I simply had a great stay and wanted to share that with you all! It looks like a great place to stay. Whitby is one of my favourite places to visit. As I live on Teesside I’m close enough to go there for day trips, so I don’t know if I can justify an overnight stay!